Oliver Fearon rediscovered his scoring boots to end a six-game goal-drought with a hat-trick that helped AFC Mansfield to a 5-1 victory over Harrogate Railway. After a shaky start, the Bulls responded in confident fashion to secure a 12th-successive Northern Counties East League Premier Division win. Both Connor Smythe and Jimmy Ghaichem were also on target — alongside hat-trick hero Fearon — to bring their side’s points total to 75 from 30 games. 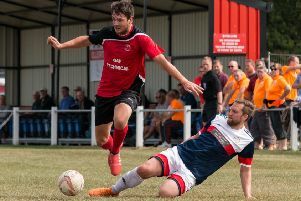 AFC assistant manager Mark Ward said: “We’re all really pleased for Ollie [Fearon] because he was getting goals at the start of the season but they had dried up a little. In the fourth minute the Bulls suffered a setback as Dan O’Donnell tapped home. However, a flurry of goals turned the match around. Smythe levelled ten minutes later and a rare goal from Ghaichem on 37 minutes gave the leaders the lead. Fearon nodded a third just before the interval from Ghaichem’s assist. Fearon bagged his second with a tap-in on 48 minutes, before firing past the keeper to secure his hat-trick in the 61st minute and complete the champions-elect’s victory.